Today, more people continue to agree that asbestos poses a health hazard. In the UK, only the white asbestos variant is still in use after the red and brown variants were banned in the late 1980s. However, even white asbestos is beginning to raise some health concerns. Fibreglass can be used to replace asbestos to fulfil insulation needs. Its heat capacity is quite high. It also has little to no side effects. However, it is slightly weaker than asbestos hence may not be best for heavy duty use. Polyurethane foam is a great roofing product, especially in heat prone areas. It comes in the form of spray paint that provides excellent insulation. Polyurethane has a great thermal resistance with the help of air bubbles trapped inside the foam. Besides roofing, it can also be used in making floatation devices, car cloth, and theatre seats. It is often mixed with plastics and rubber to increase its strength. Cellulose fibres are the most widely accepted alternative to asbestos. This is due to three major reasons. First, they are easy to process. Newsprint paper obtained from various sources is shredded into fine pieces and then treated to a few chemical processes to generate cellulose fibres. Second, their raw materials, which are often recycled paper, are readily available. Third, as you might have guessed, cellulose fibres are a green option. Also worth noting is the fact that the use of cellulose fibres can help slash your energy bills by up to 30%. Amorphous silica fabrics have an extremely high resistance to heat making them excellent insulation materials. Therefore, they are a perfect replacement for asbestos used in high-temperature areas like electrical, aerospace and shipyard industries. In such areas, lots of insulation material is needed. That only means more asbestos materials are used. 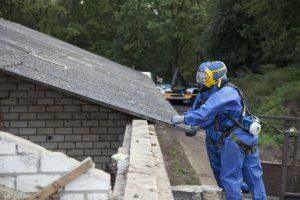 As a result, when performing the asbestos replacement in these sites it is important to involve a certified asbestos removal company like Asbestos waste solutions to minimise exposure. Note that amorphous silica cloth isn’t suitable for use in residential property as they contain traces of fibreglass. It might sound unique, but flour fillers are a great replacement for asbestos. Various flour forms obtained from pecan shell, rice hull, and wheat can be used to make flour fillers. These are then used to block cracks and crevices in walls. They act as great insulating materials and are also environmentally friendly. Since you can make these yourself, they are quite affordable too. Polybenzimidazole, commonly known as PBI, is used as an asbestos replacement in the production of personal protective equipment (PPE). They are highly resistant to heat and have found wide application in making firemen and astronaut equipment. All these options replace asbestos in varied ways. Only a few can substitute the other during application. So find the one that best suits your needs and contribute to the fight towards minimising the use of asbestos.